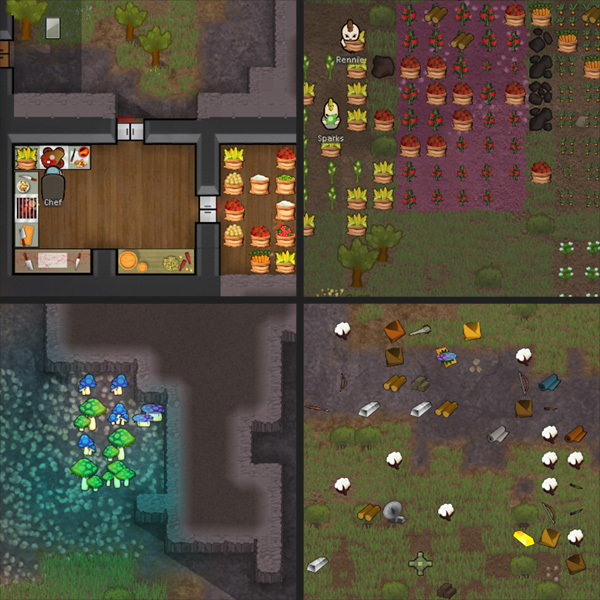 This post contains a large TEXTURE PACK for Rimworld. I've been replacing the graphics for some time, and wanted to create a mod/texture thread that contains EVERY texture that I've put together. This thread will constantly be updated. As I expand on this thread, I will add new graphics and retouch old graphics (based on user suggestions). I will also update the zip files on this page as I go along. 1. Download and unzip the core textures file (above). You should end up with a folder called "Textures"
3. Paste this new Textures folder into the core folder that exists in your mods folder (for example C:/rimworld/mods/core/). There should already exists a "Textures" folder - you will be asked to MERGE the two folders. Click 'Yes'. Don't worry, unless you have added any custom graphics yourself, you wont be copying over any files at all (just merging folders, and copying new images over). For instruction on how to go "back" and "uninstall", see below. In the instructions below, the name of a mod will be referred to as [modname]. So, for example, the folder for the mod we are talking about will me "Mods/[modname]/"
1. Download and unzip the [modname] textures file (above). You should end up with a folder called "Textures"
2. Paste this new Textures folder into the [modname] folder that exists in your "mods" folder (for example C:/rimworld/mods/[modname]/). There already exists a Textures folder and it already contains the textures for the mod. You will be asked to REPLACE these files - if you want to use our new graphics, click "yes". To "uninstall" the CORE texture replacement (no UI), you can delete all the files and folders in you Mods/Core/Textures/Things folder, with the exception of the following 3 images. Note: These 3 images are the ONLY images and folders that should exist in your CORE/TEXTURES folder PRIOR to installing these textures. Justust delete the "UI" folder in "Mods/Core/Textures/"
2. Unzip the original mod, and Copy the "Textures" folder from this mod. 3. Paste this new "Textures" folder into the mod's folder (it should be "Mod/[modname]". It will ask if you want to replace the files in this folder - click yes. For example, you have the mod Gardening. If you look into your "Mods" folder, you will see a "Gardening" folder. Inside the "Gardening" folder is a "Textures" folder. This is the folder that needs to be replaced. So, when you download the new Gardening mod, and grab the new "Textures", you need to replace the "Mods/Gardening/Textures" folder. v1.2 - Fixed the side Muffalo texture (they shouldn't run backwards now), removed character art from core (still working on this). These are just texture replacements, so there shouldn't be any conflicts. This mod is released under Creative Commons 4.0, meaning you can repackage, redistribute or alter this mod as long as credit is given, for non-commercial purposes. Get our Steel Rock Slag mod, to replace the textures of those items. ***Steel Rock Slag is a mod, and not a texture replacement, because it required editing the code a bit. Support My Work - Buy me a Beer! Texture replacements for the core graphics in the game. To download these textures, please visit the first post in this thread. To download these textures, please visit the first post in this thread. To download these textures, please visit the first thread in this post. 2/24/2014 - I revised my original textures. I made the mushroom images less "bright" ... the images were bright to begin with, but when the glow appeared on top of the mushrooms, it made them neon. Too sharp in contrast to the rest of the game. NOTE: These graphics are already included in this mod!!!! No need to download and replace these textures. Texture replacements for the core User Interface (UI) buttons in the game. To download these textures, please visit the first post in this thread. All set for Alpha 9! Texture replacements for the Mechanical Defense mod. They've chosen to include many of our graphics in their mod already ... but if any are missing, download them here. Note: This is a small sample of textures in this pack ... see more on this old thread. An example of the new robot (there are several different robots). You can view them all here. I wanted to replace the research bench in the game, but if you JUST replace the texture, then it changes color depending on the material you use to build it. So, in order to replace the texture, you will also need to edit some code. See below for where to place the graphics, and what to change in the code. Note: If you are running another mod that edits the Buildings_Misc.xml, then this may not work. You will need to add the ShaderType line to their file as well. Texture replacements for the Priority Hauler mod. These are replacement user interface (UI) buttons that match my other UI buttons. Texture replacements for the Mine Vein mod. This is a replacement graphic for the user interface (UI) button (so they match my other UI buttons). Currently Finalizing this texture pack ... more graphics soon. Texture replacements for the Glassworks mod. To download the new textures below, visit the original post in this thread. Get the original mod, without my textures here.